There are several types of common flooring materials including linoleum, marble, quarry, rubber, slate, terrazzo, unglazed ceramic tile, and vinyl asphalt. Each type of flooring has its own particular composition and therefore must be handled in different ways. 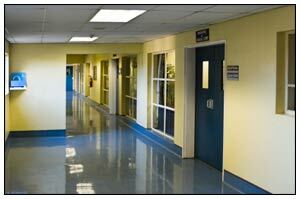 Choose the professionals at Windsor-Essex Janitorial Inc. to clean and maintain the quality of your floors. Floor maintenance programs not only improve the appearance level of vinyl floors, but a good maintenance program will also extend the useful life of the floor. Proper maintenance after the initial installation of new flooring is a must; always follow the manufacturer’s instructions for stripping and sealing of the floors, this will help you get better results out of your vinyl floor. Stripping and waxing of floors is also an important part of keeping your facility clean and for taking care of your flooring surfaces.